The Daily Tiffin: Going To a Potluck? Bring This Simple Stuffed Date Appetizer! Going To a Potluck? Bring This Simple Stuffed Date Appetizer! When I was a growing up, one of my parent's friends grew dates. She would constantly bring us bags of them and I hated it. I hated the way they tasted, I hated the texture and didn't understand the big appeal. Fast forward to my college years when a friend, who was a big date fan, had me try one. It was amazing! As in, "Waaaaah!? I've been passing this up all these years" amazing. Ever since then, I've gone absolutely crazy for dates. My favorite way to eat them is plain (I prefer Deglet Noors to Medjools), however when they're stuffed with a creamy goat cheese, toasted walnuts and covered in cracked pepper they're simply fantastic. This simple appetizer is put together in no time at all (unless you count the pitting of the dates, that can take a little while depending on your knife skills). 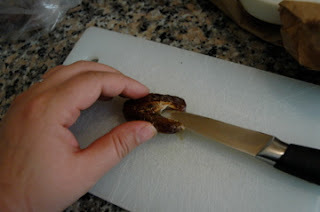 To pit the date, slice it open and use the tip of the blade to pry the pit out. Once pitted you stuff with goat cheese (if you can find a cheese with a thinner cream cheese consistency that works even better). Toast up some chopped walnuts, sprinkle on top (or better yet, mix into the cheese before stuffing) and finish the whole thing off with some fresh cracked pepper. Super delicious and super simple! Whenever I bring them to a potluck people always ask for the recipe, it's so wild to me because there's not much to do. If you give them a try let me know what you think! Tee - the cheese I use is actually a goat with that consistency! it's sooo yummy! my mom would add dates stuffed with almonds to my lunchbox. this sounds fabulous. Mmm! That sounds delicious. I'll have to try it! Are you using fresh or dried dates? what a super idea, I love sweet and savoury tastes together. Freshly cracked pepper must give it the added oomp! Since dates are so sweet, another great idea is to balance it w/ salty - I stuff them w/ parmesan and roll them in sea salt and then bake them for a few minutes. Yum! I finally found the opportunity to make these. Used pecans instead of the walnuts, coz thats all I had and they were yummy. More like dessert though than an appetizer, to me atleast, maybe coz of the pecans coz they are sweeter than walnuts. Nevertheless, delicious! Thanks for a great idea.